Oxybutynin chloride is a white crystalline solid with a molecular weight of 393.95. It is readily soluble in water and acids, but relatively insoluble in alkalis. Oxybutynin Chloride Tablets also contain colloidal silicon dioxide NF, FD&C Blue #1 aluminum lake, magnesium stearate NF, microcrystalline cellulose NF, and pregelatinized starch NF. Oxybutynin Chloride Tablets are for oral administration. Oxybutynin Chloride Tablets conform to USP Dissolution Test 2. 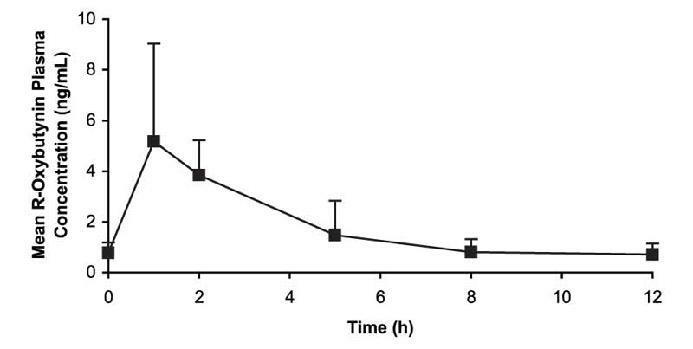 Following oral administration of oxybutynin chloride, oxybutynin is rapidly absorbed achieving C max within an hour, following which plasma concentration decreases with an effective half-life of approximately 2 to 3 hours. The absolute bioavailability of oxybutynin is reported to be about 6% (range 1.6 to 10.9%) for the tablets. Wide interindividual variation in pharmacokinetic parameters is evident following oral administration of oxybutynin. Oxybutynin chloride steady-state pharmacokinetics were also studied in 11 pediatric patients with detrusor overactivity associated with a neurological condition (e.g., spina bifida). These pediatric patients were on oxybutynin chloride tablets with total daily dose ranging from 7.5 mg to 15 mg (0.22 to 0.53 mg/kg). Overall, most patients (86.9%) were taking a total daily oxybutynin chloride dose between 10 mg and 15 mg. Sparse sampling technique was used to obtain serum samples. When all available data are normalized to an equivalent of 5 mg twice daily oxybutynin chloride, the mean pharmacokinetic parameters derived for R- and S-oxybutynin and R- and S-desethyloxybutynin are summarized in Table 2. 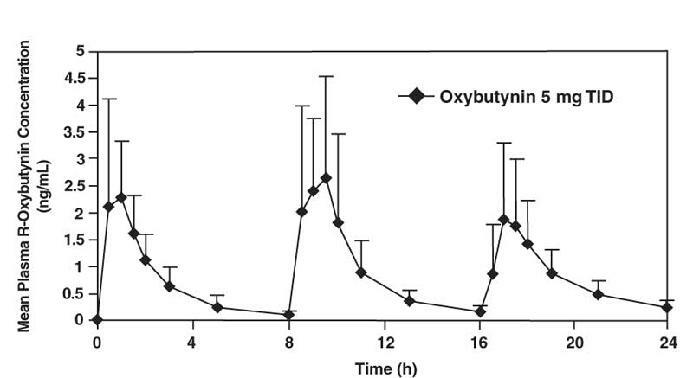 The plasma-time concentration profiles for R- and S-oxybutynin are similar in shape; Figure 2 shows the profile for R-oxybutynin when all available data are normalized to an equivalent of 5 mg twice daily. Oxybutynin is widely distributed in body tissues following systemic absorption. The volume of distribution is 193 L after intravenous administration of 5 mg oxybutynin chloride. Both enantiomers of oxybutynin are highly bound (> 99%) to plasma proteins. Both enantiomers of desethyloxybutynin are also highly bound (> 97%) to plasma proteins. The major binding protein is alpha-1 acid glycoprotein. Oxybutynin chloride tablets are indicated for the relief of symptoms of bladder instability associated with voiding in patients with uninhibited neurogenic or reflex neurogenic bladder (i.e., urgency, frequency, urinary leakage, urge incontinence, dysuria). Angioedema of the face, lips, tongue and/or larynx has been reported with oxybutynin. In some cases, angioedema occurred after the first dose. Angioedema associated with upper airway swelling may be life-threatening. If involvement of the tongue, hypopharynx, or larynx occurs, oxybutynin should be promptly discontinued and appropriate therapy and/or measures necessary to ensure a patent airway should be promptly provided. Oxybutynin chloride should be used with caution in patients with pre-existing dementia treated with cholinesterase inhibitors due to the risk of aggravation of symptoms. Oxybutynin chloride should be used with caution in patients with Parkinson's disease due to the risk of aggravation of symptoms. Oxybutynin chloride should be used with caution in patients with autonomic neuropathy due to the risk of aggravation of symptoms of decreased gastrointestinal motility. Patients should be informed that oxybutynin may produce angioedema that could result in life-threatening airway obstruction. Patients should be advised to promptly discontinue oxybutynin therapy and seek immediate medical attention if they experience edema of the tongue, edema of the laryngopharynx, or difficulty breathing. Anticholinergic agents may potentially alter the absorption of some concomitantly administered drugs due to anticholinergic effects on gastrointestinal motility. This may be of concern for drugs with a narrow therapeutic index. Anticholinergic agents may also antagonize the effects of the prokinetic agents, such as metoclopramide. Mean oxybutynin chloride plasma concentrations were approximately 3 to 4 fold higher when oxybutynin chloride was administered with ketoconazole, a potent CYP3A4 inhibitor. Other inhibitors of the cytochrome P450 3A4 enzyme system, such as antimycotic agents (e.g., itraconazole and miconazole) or macrolide antibiotics (e.g., erythromycin and clarithromycin), may alter oxybutynin mean pharmacokinetic parameters (i.e., C max and AUC). The clinical relevance of such potential interactions is not known. Caution should be used when such drugs are co-administered. The safety and efficacy of oxybutynin chloride tablets were studied in 30 children in a 24-week, open-label trial. Patients were aged 5 to 15 years, all had symptoms of detrusor overactivity in association with a neurological condition (e.g., spina bifida), all used clean intermittent catheterization, and all were current users of oxybutynin chloride. Study results demonstrated that the administration of oxybutynin chloride was associated with improvement in clinical and urodynamic parameters. At total daily doses ranging from 5 mg to 15 mg, treatment with oxybutynin chloride tablets was associated with an increase from baseline in mean urine volume per catheterization from 122 mL to 145 mL, an increase from baseline in mean urine volume after morning awakening from 148 mL to 168 mL, and an increase from baseline in the mean percentage of catheterizations without a leaking episode from 43% to 61%. Urodynamic results in these patients were consistent with the clinical results. Treatment with oxybutynin chloride tablets was associated with an increase from baseline in maximum cystometric capacity from 230 mL to 279 mL, a decrease from baseline in mean detrusor pressure at maximum cystometric capacity from 36 cm H 2O to 33 cm H 2O, and a reduction in the percentage of patients demonstrating uninhibited detrusor contractions (of at least 15 cm H 2O) from 39% to 20%. Clinical studies of oxybutynin chloride did not include sufficient numbers of subjects age 65 and over to determine whether they respond differently from younger patients. Other reported clinical experience has not identified differences in responses between healthy elderly and younger patients; however, a lower initial starting dose of 2.5 mg given 2 or 3 times a day has been recommended for the frail elderly due to a prolongation of the elimination half-life from 2 to 3 hours to 5 hours. 2,3,4 In general, dose selection for an elderly patient should be cautious, usually starting at the low end of the dosing range, reflecting the greater frequency of decreased hepatic, renal, or cardiac function, and of concomitant disease or other drug therapy. The safety and efficacy of oxybutynin chloride was evaluated in a total of 199 patients in three clinical trials. These participants were treated with oxybutynin chloride 5 to 20 mg/day for up to 6 weeks. Table 3 shows the incidence of adverse events judged by investigators to be at least possibly related to treatment and reported by at least 5% of patients. The most common adverse events reported by patients receiving oxybutynin chloride 5 to 20 mg/day were the expected side effects of anticholinergic agents. The incidence of dry mouth was dose-related. In addition, the following adverse events were reported by 1 to < 5% of patients using oxybutynin chloride (5 to 20 mg/day) in all studies. Infections and Infestations: nasopharyngitis, upper respiratory tract infection, bronchitis, cystitis, fungal infection; Metabolism and Nutrition Disorders: fluid retention; Psychiatric Disorders: confusional state; Nervous System Disorders: dysgeusia, sinus headache; Eye Disorders: keratoconjunctivitis sicca, eye irritation; Cardiac Disorders: palpitations, sinus arrhythmia; Vascular Disorders: flushing; Respiratory, Thoracic and Mediastinal Disorders: nasal dryness, cough, pharyngolaryngeal pain, dry throat, sinus congestion, hoarseness, asthma, nasal congestion; Gastrointestinal Disorders: diarrhea, abdominal pain, loose stools, flatulence, vomiting, abdominal pain upper, dysphagia, aptyalism, eructation, tongue coated; Skin and Subcutaneous Tissue Disorders: dry skin, pruritis; Musculoskeletal and Connective Tissue Disorders: back pain, arthralgia, pain in extremity, flank pain; Renal and Urinary Disorders: dysuria, pollakiuria; General Disorders and Administration Site Conditions: fatigue, edema peripheral, asthenia, pain, thirst, edema; Investigations: blood pressure increased, blood glucose increased, blood pressure decreased; Injury, Poisoning, and Procedural Complications: fall. Because postmarketing adverse events are reported voluntarily from a population of uncertain size, it is not always possible to reliably estimate their frequency or establish a causal relationship to drug exposure. The following additional adverse events have been reported from worldwide postmarketing experience with oral oxybutynin chloride: Psychiatric Disorders: psychotic disorder, agitation, hallucinations, memory impairment; Nervous System Disorders: convulsions; Eye Disorders: cycloplegia, mydriasis, glaucoma; Cardiac Disorders: tachycardia, QT interval prolongation, chest discomfort; Gastrointestinal Disorders: decreased gastrointestinal motility, frequent bowel movements; Skin and Subcutaneous Tissue Disorders: rash, decreased sweating; Renal and Urinary Disorders: impotence; Reproductive System and Breast Disorders: suppression of lactation; General Disorders and Administration Site Conditions: hypersensitivity reactions, including angioedema with airway obstruction, urticaria, and face edema; rare anaphylactic reactions requiring hospitalization for emergency treatment; Metabolism and Nutrition Disorders: anorexia; Respiratory, Thoracic and Mediastinal Disorders: dysphonia. The usual dose is one 5-mg tablet two to three times a day. The maximum recommended dose is one 5-mg tablet four times a day. A lower starting dose of 2.5 mg two or three times a day is recommended for the frail elderly. The usual dose is one 5-mg tablet two times a day. The maximum recommended dose is one 5-mg tablet three times a day. Pharmacist: Dispense in a tight, light-resistant container as defined in the USP/NF. 1 Yong C et al. Effect of Food on the Pharmacokinetics of Oxybutynin in normal subjects. Pharm Res. 1991; 8 (Suppl. ): S-320. DOSAGE AND ADMINISTRATION: Adult- One tablet two to four times a day. Pediatric patients - (see Precautions). One Tablet two to three times a day. See package insert for prescribing information. STORE at 20ºC to 25ºC (68º to 77ºF) [see USP Controlled Room Temperature]. Manufactured By: Tulex Pharmaceuticals Inc.